The thought of asking for money makes me feel...overwhelmed. I admire the courage of those who can successfully fund raise. 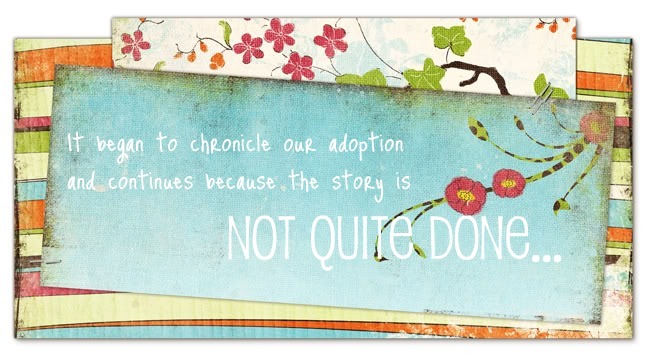 During our adoptions, we plugged along scraping together payments and selling stuff hoping that the ends would meet. Nevertheless, I feel somewhat empowered to fund raise on behalf of those who are unable to hold their little palms out. There's an uncomfortable truth that settles in when we are in Ethiopia working with the kids at our CarePoints. Kids that have come to know and rely on a full tummy every day, water that won't make them sick, teachers and care-givers that love them and guide them, and medical care when they need it. They laugh and play with energy and abandon because they have hope for their future. The uncomfortable truth is revealed when you look around the edges of the CarePoint and see thin, dirty kids waiting and watching and wishing. A few months ago, when I caught wind of this project, I started making a list. It's still stuck to my fridge. A few measly ideas that might generate some money for the building project. One of them was to make bracelets to sell. 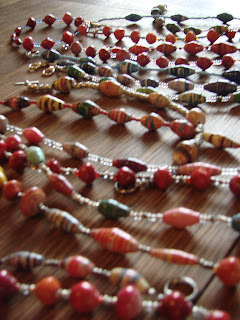 I ordered loose magazine beads from an organization that connects women in Uganda (beadforlife.org) with the worldwide market. Then, I hosted a night for my senior high girls to have dinner and make jewelry. We had a blast, spilling beads all over the place and exclaiming over the creations that we produced. At the end of the night, I bundled the bracelets up and they have just sat...and sat. I was waiting to figure out how to connect YOU with a bracelet or pair of earrings. Each time I see the brown satchel filled with jewelry, I have a pang in my heart. The donations might be just enough, when coupled with many other efforts, that make a way for 150 children to begin attending Kind Hearts in the fall. Finally, I have come to the conclusion that simplicity is beautiful. We will sell the bracelets for $10 and earrings for $5, which includes shipping. I cannot possibly post a picture of each piece of jewelry, therefore, yours will be a wonderful surprise! Make the payment to me via paypal, include any directions for mailing in the comments. They are all different and beautiful. The beads made by beautiful women in Uganda, the bracelets made by beautiful teenagers at my dining room table. In Ethiopia I got sick. I was worse than I wanted to admit. My pride kept me from swallowing the magical Cipro that would eventually make me feel better. Half-way into the week with sleepless nights and an upset belly, my attitude started to change. Little whispers of doubt floated past my ears. I felt inadequate because I couldn't speak Amharic or Oromiffa. I felt inadequate because there are so many children who clamor for attention and goodies. Even with a 10 day trip, there is never enough time. I allowed the doubts to linger too long. They didn't float anymore, but settled near me. I was ill, missed my family, and doubted my purpose on this trip. I felt selfish in being there. The sacrifice of time and money for me to be in Ethiopia weighed heavily on my heart. I was standing on the property at Trees of Glory looking out over the buildings and into the valley where the stream runs. I felt discouraged and alone. Glancing over to my right was one of the Hopechest staff members, Alex. Over the past two years I have come to admire him and enjoy the time that we have with him. He was walking towards me, smiling, and directed my eyes to the swarm of excited children playing soccer. "They love when you come. Just a few weeks ago the new children couldn't even tell us their names. They were scared, but when you all visit they open up. Only a few days and look at how happy they are. Your work here is so good." His words were a balm to my soul. My discouragement? Not from God. Going to Ethiopia? Not selfish. The two of us stood there smiling. Alex, because he is usually smiling, and me, because God had seen my spirit flounder and sent a kind word of encouragement. The classrooms at Kind Hearts are crowded with children who are excited to be given the opportunity to attend school. Many of their friends and relatives do not have an education. They are proud to be students, wearing their tattered uniforms and sitting in the crowded classrooms. There are many children around Kind Hearts that roam the streets during school hours. Their families don't even have the money for the necessities. Education is expendable. As the children are fed, educated, discipled and as the school becomes more self-sufficient, another need becomes obvious. There are many more children who are in desperate need of what is being provided to these 150. The solution, it would seem, is to add more school rooms. Right now, the rooms are quite full (envision mother hubbard). By adding another building, just like the existing one, with four classrooms, another 150 children could attend Kind Hearts. This is a pressing matter because of time. School is on break right now, but will start again in September. Donations towards this, right now, will enable the school to add the building and enroll students for the upcoming school year. 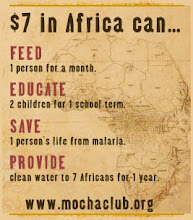 Pictures from previous posts show how sponsoring a child can change their life. More classrooms mean more children who can be sponsored. That means more children who are fed and educated while still living with their families. This program, to me, provides for children before they become orphans. The single mother of five young children would never dream of providing what her children now receive through Hopechest sponsors. Not only are her children fed and in school, but she has been given hope. I am watching our little boy begin that transition into adolescence. One minute he stands in the backyard fort as the pirate captain. The next he's too busy with his ipod to be bothered by anyone. He's worn out my Tolkien collection. They were pristine until he read them a dozen times...last week. I'm amazed. Then, he dons hobbit apparel and directs all of the siblings into appropriate costumes and tells them what member of the fellowship they will be. Tonight we went out together--just the two of us--for ice cream and bantering. I needed a haircut and tried to coerce him to join me. He laughed and said he wasn't about to let that lady touch his hair, rolling his eyes as if I had lost my mind. When we got back home he slipped into bed and, as I walked into the light of the hallway, he whispered, "You didn't kiss me goodnight." For a while longer, he remains, our little boy.